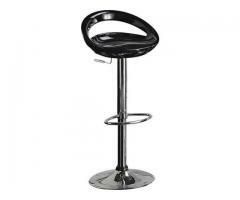 Gas lift bar stool, it also looks great in the kitchen. 1. Seat height 82cm. 2. Adjustable seat. 3. Seat height 62 to 84cm. 4. Foot rest. 5. Chrome plated frame. 6. Packed flat for home assembly. 7. Size H100, W47, D44cm. 8. Weight 6.2kg.